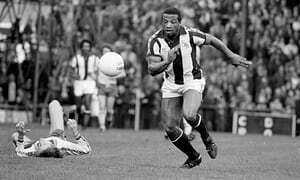 The tributes for Cyrille Regis, ex-England International footballer who died aged 59 on the morning of Monday 15th January 2018 show the greatness of the man. A torch bearer in dark times. The most handsome, and coolest of personalities, has been lauded by all as a true gentleman; a black man who showed the strength, skill and subtlety on a football pitch, when blacks were excluded from the game by racial abuse and bias in the late 1970’s when he emerged as a young player. With Laurie Cunningham and Brendon Batson playing for West Bromwich Albion they were dubbed “The Three Degrees” after the black american female singing group, who made the UK their audience after a string of pop hits, courted Prince Charles as an ardent admirer. Adrian Chiles, well known as a Sports and Current Affairs TV presenter, equally well known as a die hard West Bromwich Albion fan spent most of that Monday, playing a lead role in giving his personal tribute, as a fan, friend and broadcaster who was only a child when Cyrille burst on to the scene as professional footballer at a time when only a handful of black players had made it to highest level of English football. 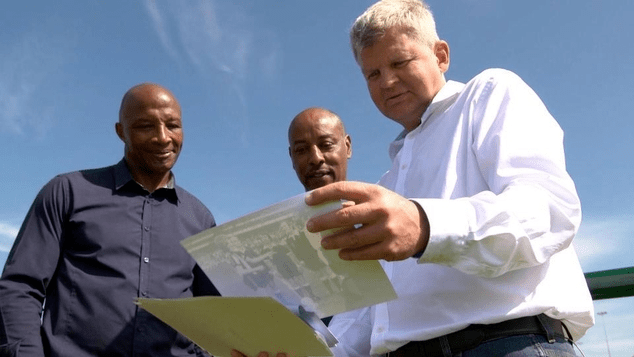 Having a close association with Cyrille, who became a personal friend, Chiles who grew up within sight of the West Bromwich’s ground ‘The Hawthorns’ in his heartfelt tribute as a local, described a historical narrative of the hard journey that black people experienced in the UK from a midlands perspective. He talked of riots in Handsworth, West Bromwich Albion being next to Smethwick, the infamous constituency once the hotbed of the most xenophobic of attitudes, the volley’s of chants the ‘N’ word from opposition supporters that greeted Regis, Cunningham and Batson every time they played away. How they had to reconcile the harsh discriminatory culture in football at the time, on the terraces and even from within the dressing room and their own club, pushing back against the false stereotype that blacks couldn’t play in the cold and wet weather, until their sublime skills and determination to defeat the direct and subtle bigotry throughout their journey to establish themselves as more than worthy professionals at the top echelons of the national game. Chiles spoke of the nostalgia of seeing Regis in full flight as a physically perfect male specimen on the field of play leaving the most accomplished defenders of his time unable to subdue or combat his strength, as he channelled his emotion to succeed through his craft that he had had to work at against all the odds that a young black boy in the late 70’s would have faced. All of this with a gentle nature, and unassuming character that was respectful, courteous and willing to help others at a mere notion. 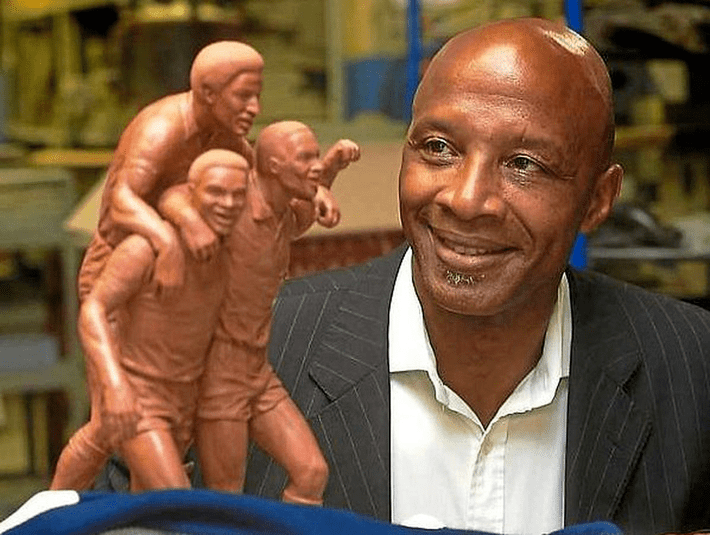 Formers players both black and white, have lauded Cyrille with tributes and comments, about his professionalism, being a great guy to be with, inspiring subsequent generations, being a role model for all people despite the context of his struggle. Never rising to the bait of a hostile environment, but responding with an exemplary character that can only be admired. Why this man is so honoured is because everyone knew his struggle. The word pioneer has been mentioned many times these past few days. In fact where black britons were not getting the publicity, Regis along with his fellow black teammates, Laurie Cunningham and Brendon Batson were the opposite of how black men were being framed stereotypically by the media as lazy, wild with aggressive attitudes. With their success and the exposure that football had in press and television this was the beginning of realisation that blacks who lived in the majority of cases separately from whites but worked amongst them, that they were the very same as them. West Bromwich Albion’s playing three black players all of whom were playing more than significant roles in one of the top teams of the day, won over the hearts of the white working class for who it was easy to express their aversion to difference, but could only grow to appreciate the grace, style and hardwork of Regis, Cunningham and Batson. The truth is they made black people proud and I daresay the nation proud, because deep down everyone knew they were the just a sample of whole communities who were continually excluded unfairly from society, but given the chance would lay to rest the ridiculous notions that people of a different skin colour were any different from the majority white population. Regis was one of our first public examples, that toiled in an industry, which everyone had a window into at a time when half the nation watched football through BBC’s Match of the Day each weekend, or ITV’s The Big Match. Regis the centre forward, scoring goals it now meant we were able the measure a black man’s performance in public; we were able to relate to his value in the team and to the club, the supporters and the game itself. We could compare him on the playing field with the others and know that we should and have the right to be there. There were many Cyrille Regis’s, male and females in communities, business’s, corporations, local authorities up and down the country playing a more than valuable role against the odds; important players of the team determined to show their skill so much that respect had to be given, with the appreciation that followed. Regis with his being more than played his part, in shaping new attitudes in the UK, as did many other black players who were starting to break through into the professional game such as Viv Anderson, Garth Crooks, Bob Hazel, Luther Blissett, Ricky Hill. Regis continued to do so after retiring by protecting his legacy moving onto becoming a successful football agent passing a sense of responsibility down to the next generation professional footballers that followed him. The Andrew Coles, Dion Dublin’s, Ian Wright’s, Mark Bright’s and so many more. Cyrille’s story is a kind of the underdog coming good, but at the same time it map’s the emergence of a new found unsaid respect and admiration by all of what black communities faced and their resilience. I reflect and see Cyrille’s contribution in his professional capacity as the beginning of a change in attitudes for many. That’s why I believe he is an important icon for us all.